Learn about Minneapolis - St. Paul? Location is key,, this is located perfectly for sporting activities, parks and recreation, concerts, and night life. Everything you want to do you can walk to in 10-15 mins. Super clean. Kept up with the times. Some other places nearby that are 4-5 star are stuck in the past. Also in deciding my stay, comparing website and pictures, yours had detailed pics of different price ranges of rooms. So you can see what your getting. Awesome.Thank you for everything. Overall the experience was very good however, I did not like the expresso machine in the room. I prefer regular coffee and I found the expresso undrinkable. I did not see any place that I could get coffee except the restaurant where I would have had to pay for it. The room was beautiful and very clean. Every one was extremely polite and helpful. The hotel itself is beautiful! If you like expresso coffee this hotel is perfect for you. Where to find Minneapolis - St. Paul hotels near an airport? How can I find hotels in different Minneapolis - St. Paul neighborhoods? Where can I find hotels in Minneapolis - St. Paul that are near tourist attractions? Travelers will find a generous range of hotel choices in Minneapolis - St. Paul. Our database contains 73 accommodation options within a 0.1-kilometre (0.1-mile) radius of Minneapolis - St. Paul's center. The Days Inn St. Paul-Minneapolis-Midway is amongst the most convenient options, because it is one of only a small number of options within walking distance of the Minneapolis - St. Paul center. Minneapolis is a popular accommodation neighborhood. 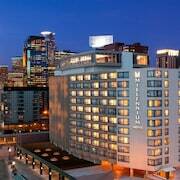 Minneapolis is 7 kilometres (4 miles) from the heart of Minneapolis - St. Paul, and boasts 32 Expedia-listed hotels. Some of the more popular of the places to stay in Minneapolis are the Hotel Ivy, a Luxury Collection Hotel, Minneapolis and Residence Inn By Marriott Minneapolis Downtown. But of course, a visit to Minneapolis - St. Paul wouldn't be complete if you don't make a visit to Mall of America. The Radisson Blu Mall of America and Embassy Suites by Hilton Minneapolis Airport, are within a short walk of Mall of America. If you are booking a trip to Minneapolis - St. Paul to spend some time at Mill Ruins Park, Basilica of Saint Mary and of course the University of Minnesota-Minneapolis, why not stay nearby? Local hotel options for Mill Ruins Park are the Loews Minneapolis Hotel and the Residence Inn Minneapolis Downtown at The Depot by Marriott. While the Loews Minneapolis Hotel is 1 kilometre (1 mile) from Mill Ruins Park, the Residence Inn Minneapolis Downtown at The Depot by Marriott is situated 1 kilometre (1 mile) away. The Radisson Blu Minneapolis Downtown is 1 kilometre (1 mile) from from Basilica of Saint Mary. 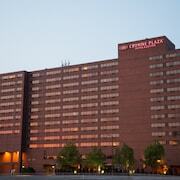 The Marriott Minneapolis City Center is also easy walking distance. The Commons Hotel Minneapolis and the Aloft Minneapolis are near the University of Minnesota-Minneapolis. It is only 0.5 kilometres (0.3 miles) to The Commons Hotel Minneapolis and 2 kilometres (1 mile) to the Aloft Minneapolis. You could also check out The Saint Paul Hotel as well as The Westin Edina Galleria. The Saint Paul Hotel is situated 8 kilometres (5 miles) away from the heart of Minneapolis - St. Paul. The Westin Edina Galleria is positioned 12 kilometres (7 miles) away. The Kimpton Grand Hotel Minneapolis and also the Le Meridien Chambers, Minneapolis are two alternative accommodation options worth checking out in Minneapolis - St. Paul. Downtown Minneapolis is 7 kilometres (4 miles) to the northwest of Minneapolis - St. Paul, and is where you'll find the Minnewaska Lake and New Century Theatre. If you'd like to stay in Downtown Minneapolis, be sure to check out the W Minneapolis - The Foshay and Courtyard by Marriott Minneapolis Downtown. 8 kilometres (5 miles) to the east of Minneapolis - St. Paul is Downtown St. Paul, which is home to the Holiday Inn St. Paul Downtown and Embassy Suites - St. Paul. While in Downtown St. Paul, set aside a little time to check out Minnesota Centennial Showboat and Alexander Ramsey House. Minneapolis - St. Paul International Airport is a logical airport for arriving in Minneapolis - St. Paul. It is 6 kilometres (4 miles) away. If you plan to stay nearby, try the Homewood Suites - Mall of America or Country Inn & Suites By Carlson Mall of America. Are there hotels in other cities near Minneapolis - St. Paul? What other types of accommodations are available in Minneapolis - St. Paul? Explore Minneapolis - St. Paul with Expedia.ca’s Travel Guides to find the best flights, cars, holiday packages and more!